Toby obtained his Ph.D. in Mechanical Engineering from Stanford University. He began his career at Star Medical, where he led research and development of a novel laser-based imaging system along with overseeing numerous clinical studies and authoring the user manual for the LightSheer hair removal laser. Toby's passion for excellence and science drives the innovation of Tria's revolutionary light based skin solutions. How does your background (as a Tria founder) influence your approach to light science? In the beginning, it was our hope that we could bring the benefits of clinic-based treatments to the home. We've shown that we can and provide people with access to great phototherapy. We've learned what aspects of the science and engineering are most important for our particular products and our customers. 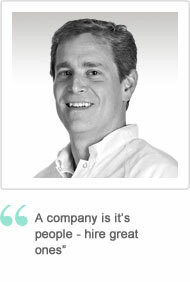 A company is its people—hire great ones. And we have. You won't find a company with more capable and dedicated people than Tria. It's wonderful to be a part of. How do you relate to customers? Hardly a day goes by where I don't interact with someone who's using or is interested in our products. What Tria advancements are you most excited about? I'm thrilled that we've been able to simultaneously lower costs while at the same time make the products better, such as faster and easier to use. Dr. Liu leads Tria Beauty's research and development efforts and oversees a team of scientists that span multiple disciplines including optical physics and mechanical, electrical and software engineering. He was a key member of the engineering team that created the first Tria Hair Removal Laser and Skin Perfecting Blue Light device for treating acne. Prior to joining Tria Beauty, Dr. Liu served as Senior Systems Test Engineer at Carl Zeiss Meditec, Inc. At Star Medical, Coherent Medical Group, and Lumenis Ltd., Dr. Liu contributed to the development of several key cosmetic laser and UV treatment products including LightSheer, BClear and ReLume. Dr. Liu earned a Ph.D. in semiconductor device research from Stanford University and a B.S. in Electrical Engineering from the California Institute of Technology. What sets light-based skincare apart from other treatments? Light therapy is inherently a more effective treatment to affect tissues below the skin's surface [than other topical treatments]. Its skin-penetrating property and selective absorption by the desired targets makes it an ideal non-invasive treatment. Describe your approach to innovating with light? Tria's approach for innovating with light is to identify the unique light spectrum and develop light engine technology with sufficient power to achieve effective therapy. We design simple-to-use and elegant devices that customers can adopt into their routine safely and simultaneously achieve great results. With four U.S. patents to his name, Dave is an expert in new product definition and development of medical devices. Not only did he architect skin rejuvenation prototypes of Fraxel®, he was also involved with the Thermage® product line engineering at Solta Medical. At Tria, Dave provides technical leadership in state-of-the-art mechanical and industrial design as well as product development. How do Tria engineers develop industrial designs? We start with dozens of prototypes that include functional breadboards, design (look and feel) models and functional devices that are used in early clinical investigations. We partner with design firms and test prototypes with consumers. At what point do you know when a prototype is ready to be a commercial design? With the look and feel models, we usually get to one that connects with a lot of people—one that looks and feels just like the end product we had in mind. How does Tria deliver the same dermatologist proven technology at home? By capitalising on technological advances in diode—based laser light sources, and smart design. We pride ourselves on ease of use with the consumer in mind. Is there anything about working with light that is challenging? The optical elements that are required, such as precision lenses, are generally expensive items that require custom designs—taking a long time to develop and produce. Getting these components quickly and economically into home devices is challenging. Pat has over 20 years of experience in laser/optical systems research and development, mechanical design and process development. He oversees a team of engineers and technicians to design and develop state-of-the-art medical light based systems. He provides technical leadership with solid fundamental physical understanding, and creates and tests new product concepts. Where do you find inspiration for new product concepts? Most of my inspiration actually comes from talking with people about our existing products. Once they find out what we make, there is always the question of…can you guys do this or that other thing with light. How do you determine the correct type of light for Tria designs? The correct color of light for a specific design is chosen based on established research by the scientific community and our own clinical test data. How is Tria innovating its product designs to make them state-of-the-art? We continually test and measure our performance against metrics such as treatment efficacy, manufacturability, cost to manufacture, consumer usability and reliability. Do you test products on yourself? Of course! I'm an engineer and an experimentalist at heart. Most of us who work here have tested our products on ourselves. Final efficacy data for all of our products, however, is always based on clinical study results. John received his Masters in Applied Physics from Stanford. Since then, he's added three patents to his name showcasing his expertise in system architecture. John's ability to inspire creativity and provide leadership in optimising and documenting software embedded systems and manufacturing test tooling host software is invaluable. Starting from a list of requirements, each new feature not previously demonstrated in other prototypes or products are tested with purpose-built experimental setups. Once proven, these are included in the new prototype design which includes circuit design as well as mechanical and optical design. How have Tria Laser and Blue Light learnings been applied to future developments? Our approach to skin contact sensing and battery qualification, among other things, has evolved and improved based on experience with these previous products. How have successful innovations in other fields inspired/influenced Tria designs? One example of cross-fertilization is our use of lithium ferro-phosphate battery technology, which has properties that are especially well-matched to the requirements of the hair laser. This type of battery was originally produced for use in electric bicycles. Describe the relationship between technology and beauty. Technical advances in solid-state optical devices, including infrared lasers and high-power LEDs, have enabled new types of skin treatments which were never before possible. Our beauty press releases keep you informed about the newest products, company hires and other important developments. Tria Beauty Announces Key Hires in Europe and U.S.
Tria Laser Hair Removal System Debuts on "The Doctors"